Like many new things I see on the menu, I was compelled to give the machaca a try. What is machaca? It's shredded beef with scrambled eggs. What's not to like? Nothing. It was delicious and a deal at $3.29. 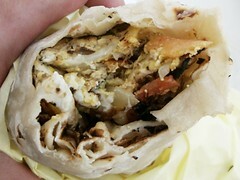 This particular photo was taken at breakfast time, though the machaca can be prepared at Benitos any hour of the day. This Benitos Taco Shop meal was rated: 7.3. Sunday, February 26, 2006 by Jonah.